"Forgotten Empires," originally a fan-made mod, has received the official expansion status for Age of Empires II HD. Well here's something you don't see every day, Age of Empires II, a game which is over 14 years old, is getting a brand new expansion pack. "Forgotten Empires," originally a fan-made mod, has received the official expansion status for the Age of Empires II HD Edition, and will be released this fall via Steam. New campaigns: Four new campaigns, all set in the Italian peninsula over its long and messy history (Fall of Rome, Mercenary fighters, the Byzantine campaigns to reconquer Italy, etc). New map scripts: Acropolis, Golden Pit, new Megarandom, etc. New AI: Uses competitive builds and does not cheat. 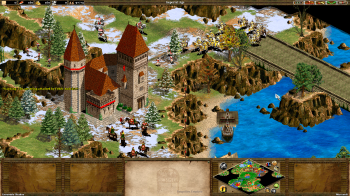 If you own the original Age of Empires II (not the HD re-release) you can actually already download the mod and try it out for free. It would be a safe bet to assume it will also be a free download when it comes out for the HD edition this fall. Forgotten Empires includes 5 brand new civilizations: the Italians, Indians, Hungarians, Slavs, and the Incas, 30 new technologies, 9 new units, and a population increase to 1000. You'll be able to play with these new toys on 11 new maps.